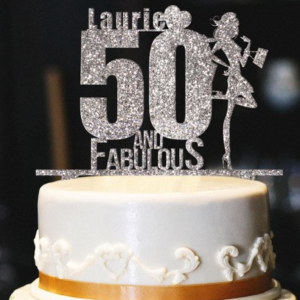 If you are a baker of amazing cakes, you need to browse our catalog of cake-toppers for every type of cake or occasion. We have the most amazing toppers for your exceptional cakes that will make that event extra special. No matter the occasion and no matter the theme, we have the perfect cake topper for your cakes and you can customize them for that little extra uniqueness. Our cake toppers cater for events like Baby Showers, with 30 different variations for you to choose from you are spoiled for choice. Boy or Girl, or both, you can select the cake topper you like and have it customized according to your desires. The designs are made in wood or sparkly glitter for you too choose from and each design has several variations and colors. Make the next birthday cake the one to remember with over 70 different birthday cake topper designs. You can choose from a classic number design to some of the most extravagant and unique birthday motifs for the most amazing birthday cake ever! Celebrating the engagement of friends or family is one of the most special moments in our lives and what better way to celebrate it than with a keepsake cake topper. We have a host of different designs from the classic to the hilarious. Cakes are used to celebrate and commemorate special days and events and they come in all shapes and sizes. When you browse our catalog of cake toppers, you will find that we have just about every type of cake covered or topped if you will, and you can make this cake the one to beat for all future events. Why not step out into life and have a graduation cake that sets the tone. Our cake toppers for graduations is something to be seen, there is wooden and “glitterized” designs each with customizable year and name or class sections. Stepping out in to the world is so much more special with our customizable cake toppers! Dad is a special guy in your life, and we all know that Dad loves him some cake on his special day, even though they would never admit it! Make you Daddy feel like Super-Dad with a unique cake topper from our catalog and he can even put it up in his tool shed after. We saved the best for last, Wedding cakes are always something to behold and cherish. Cutting the wedding cake is the one tradition that always is present at a wedding celebration. As important as tradition is, why not make the wedding cake the “bell of the ball”, apart from the bride of course, with a customizable cake topper that will add that something extra that so many just can’t explain. With more than 100 variations and designs to choose from there is no theme or couple that our cake toppers wont surprise and amaze!